We dubbed ourselves IVE 2.0 and welcomed new Artistic Director Michael McGaghie to the podium. It was the best ‘getting to know you’ experience for him and the choir. The 2018 season was called “Horizons” and explored all senses of that interesting word. 2017 marked the centennial of the birth of Artistic Director Scott MacPherson's mentor, Robert Fountain. Dr. Fountain's profound influence touched the lives of many of the singers in IVE, and we honored his legacy through song. It also marked the final year that IVE sang under our founding director, Dr. MacPherson. Friday, August 5, 2016, 7:30 p.m.
Sunday, August 7, 2016, 3:00 p.m. Thanks to those who joined us for our 15th season. We performed the world premiere of Andrew Rindfleisch's Song of Jubilation (2016), and sang our hearts out to Johannes Brahms's A German Requiem. Both works were performed with a fantastic 43-piece orchestra. Soloists in the Brahms were Sarah Brailey, soprano, and Paul Rowe, baritone. Thanks to those who joined us for our 14th season. We titled it "Uncommon Images." We performed the world premiere of Corey Rubin's "The Snow Man (2014)." We were assisted by Valree Casey, oboe; Mary Ann Harr Grinde, harp; and Jane Peckham, piano. Thanks to those who joined us for our 13th season of transformative choral performances featuring masterworks by Raminish, Purchell, de Prez, Rindfleish, and Brahms. Kathy Otterson sang a haunting solo in "There's a Man Goin' Round." I. Langsam und ausdrucksvoll: Warum ist das Licht gegeben dem Mühseligen? Thanks to those who joined us for our 12th season of transformative choral performances featuring masterworks by Bach, Brahms, Mahler, Sweelinck, and Britten. 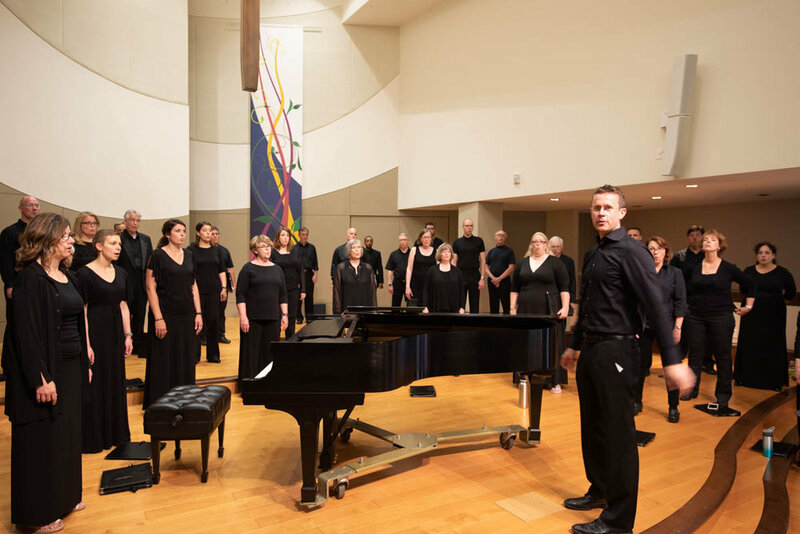 Thanks to all who joined us for our 11th season of transformative choral performances featuring masterworks by Mendelssohn, Brahms, Stanford, and contemporary works, including a world premiere! This year we performed Friday evening in the glorious acoustics of Luther Memorial Church (and yes, the air conditioning was on...as promised), and Sunday afternoon in the more intimate Covenant Presbyterian Church. Our 10th season featured TWO concerts rather than our usual single performance. Both featuring choral masterworks spanning five centuries, from Gibbons to Bach to Lotti to Lauridsen to Mendelssohn to Rindfleisch.